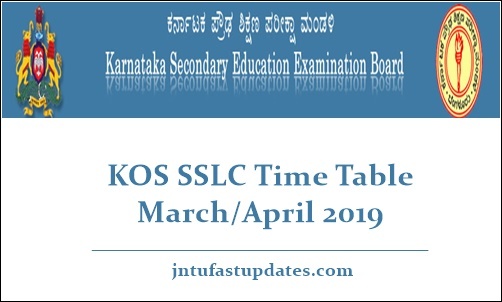 KOS SSLC Time Table 2019: Karnataka Secondary Education Examination Board (KSEEB) rolled out the time table for Karnataka Open School SSLC Examinations March/April 2019. All the students who are presently gaining education from the KOS can check the KOS SSLC Date sheet 2019 and prepare well for the exams. As per the KSEEB Notification, KOS SSLC/Class 10th exams 2018-19 will be conducted from 21st March 2019 to 4th April 2019 for a duration of 15 days. Aspirants can check the subject-wise exam dates, timings, and detailed information from this article. Karnataka Secondary Education Examination Board (KSEEB) is the Karnataka state education board that offers the secondary and higher secondary education. The board yearly monitors the education system of SSLC, HSC classes and organizes the academic examinations for the students. Yearly, a large number of understudies comes out of the KSEEB board with a good pass percentage. The Karnataka education board usually organizes academic examinations in March/April months and releases the result in the month of May/June. Along with the regular academic examinations, KSEEB will also monitor the Karnataka Open School (KOS) Secondary School Leaving Certificate (SSLC) examinations every year. With the regular examinations, the KOS SSLC exams will also take part. Students presently pursuing under KOS can download the SSLC/10th class date sheet 2019 from the KSEEB official website, kseeb.kar.nic.in. After downloading the time table observe the details of examination dates (subject-wise), timings details from it. Students can have a clear understanding of their preparation by observing the date sheet. For the reference of KOS SSLC Students, here we mentioned the KOS SSLC Date sheet 2019 below. Students appearing for Karnataka Open School SSLC Exams March/April 2019 can visit the KSEEB website and download the time table to refer it further. Follow the process given below to download KOS SSLC Date sheet 2019. Visit the KSEEB portal, kseeb.kar.nic.in and you will be navigated to the homepage, initially. Search for KOS 10th Class/SSC Time Table 2019 Download link on the homepage. The KOS SSLC Date Sheet 2019 will be downloaded on the screen.